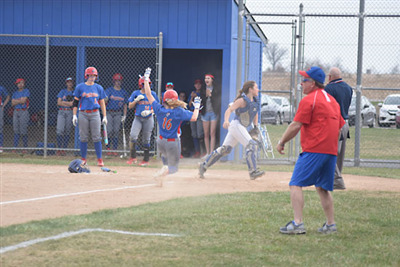 HARROD — A six run first inning led to a commanding run rule victory over Allen East, giving Crestview a much needed NWC win after a gut-punch of a loss to Bluffton earlier in the week. The Lady Knights sent 10 batters to the plate in the first, and never looked back. Four base hits, an error and a pair of free passes led the six run first inning. Bailey Gregory led off the game with base knock, and Olivia Cunningham brought her in with a fielder’s choice. Codi Miller and Hannah Binnion kept the inning going, with the latter’s double not clearing the outfield fence by mere inches. Kali Small got the win, improving her record to 5-3. She tossed five innings, giving up five hits and two runs. Small garnered a lot of swing and misses as she had seven strikeouts. The Gregory sisters (Lexi and Bailey) combined for five hits, five runs and three RBIs. Lexi left the yard with a big fly in the fourth inning. The Knighs will be playing in the quad softball outing at Lincolnview on Saturday.